Classes are 55 minutes and held at The Dance Spot, 605 E Ogden Ave, in Naperville, Illinois. Classes are sold in cards of 4 or 8 classes OR you can drop in for $20. You can use your punch card for any of the appropriate level class(es). Registration for this all levels of ATS® class, aka Group Belly Dance, is offered through Eastern Groove Dance Studio. Bare feet, socks or ballet slippers are fine. Please arrive for class quietly and a few minutes early. Classes are taught in small groups to insure safety and proper attention to each student. There is no set timetable at each level, but moving on to Levels 2 and 3 are at the teacher's discretion. Opportunities to perform (local festivals, belly dance events) pop up during the year. Performing is strictly optional and at the teacher's discretion. 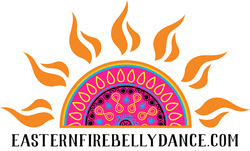 For those with no belly dance experience or no ATS® dance experience. You'll be introduced to basic movements and concepts. You will also get an overview of the various styles and learn the connection between Cabaret/Modern Egyptian belly dance and American Tribal Style®. The special drop-in rate for this class is 2 classes for $15. Wednesdays at 7:30 p.m.
You'll learn Level 1 moves and start be comfortable the concepts of both leading and following. You'll also learn proper alignment and form to insure safety in the dance. You will continue through the slow and fast vocabularies. Every class will include dance drills to in order to build good technique. Zills, provided by the studio, will be introduced. Mondays at 8:30 p.m. and Saturdays at 10:30 a.m.
You will delve deeper into the ATS® vocabulary of moves, the technique, play with formations and start to see the possibilities ATS® offers dancers. ﻿ Wednesdays at 6:30 p.m.
With teacher approval: You will be perfecting ATS® technique and its aesthetic, with possible public performances. Dancers receive in-depth and personalized critiques on their technique. This is for the experienced ATS® dancer wanting to perfect their ​dance, taking it to the next level. This class will focus on properly preparing the dancer to dance. It builds neural pathways and increases muscle memory. The class emphasizes Level 1 and 2 moves and the teacher will take requests provided enough notice is given. This is a great supplement to weekly classes or to learn moves at a slow, methodical pace. Mondays at 7:30 p.m.
Drop in class! All dance and no talk! No instruction, no partners or formations, just follow along and bliss out. Open to ALL students and all levels. Perfect for students who want ”empty brain time” to dance and get the steps deep into muscle memory. The 3rd Saturday of every month; $5 for Eastern Fire students with a current punch card, $10 for all others. Please pay at the studio; cash, check and credit cards accepted but exact change is always appreciated. Saturday at 10:30 a.m.
Grace is available for private lessons; 55-minute sessions start at $50 for one person, $80 for two people. Call her at 630-988-4443 or﻿ email for more information. ​"Though I connected with belly dance the first time I shimmied . . , there is something about ATS® that resonates with me on a visceral level. It's so awesome the way this dance form connects women to women, empowers us and give us a place to support each other. And while I knew Grace as a phenomenal dancer, she's also an incredibly gifted teacher. She encourages us, challenges us, and inspires us. I feel like I've found a dance home with EFBD."